God is, indeed, faithful! 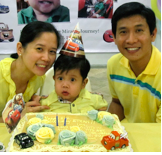 Ethan turned 2 last March 27 and his growth has been remarkable ever since the PTLD saga. We praise God daily for watching over our dearest little boy. To give you some back story, we first noticed in December that there were stains of fresh blood in Ethan’s stool. By January, his lymph nodes not only increased in size, but also in number around his neck. Although he remained active, doctors suspected a gastro-intestinal problem or worse, it can be post transplant lymphoproliferative disorder or PTLD. Ethan was admitted for CT scan which was supposed to be just a simple procedure but became complexed because of albumin deficiency. By February, his condition worsened, and he developed severe colds which caused him difficulty in breathing. His lymph nodes had gotten bigger including the adenoids which blocked his nasal passage, causing him to breathe only through the mouth. Fearful that his condition would worsen, we wanted biopsy done asap so we’ll know the next steps to take. The biopsy procedure turned out critical. He even stayed overnight in ICU because his oxygen levels dropped. Lab results confirmed signs of PTLD at the early stage. Doctors wanted to treat his condition as “malignant” and keep him at the hospital in order to start chemo therapy treatment right away. In shock with their proposed management, we consulted his doctors in Singapore, who asked us to bring Ethan to them immediately. Another pathology was run in Singapore and in God’s miraculous power, results showed it was PTLD but on a much earlier stage. What a relief it was when we heard the doctors say, “It’s actually better than we’ve expected... Treat it and call it as an infection... I mean, it’s not even cancer...” Praise God, there was definitely no need for chemotherapy! Another drug was even unnecessary. All they did was stop the PROGRAF, a supposedly life-long immunosuppression drug for the protection of the liver graft, a drug which also prevented Ethan’s good cells from stopping the proliferation of bad cells. As treatment, Ethan was also given an anti-viral medicine for a month. Looking back, Tina recalled the miracle prayer list she had written last January and Ethan not taking PROGRAF is one of them (so that his immune system will go up)! Truly, God has done another miracle for our precious son. Doctors cannot really conclude if Ethan will still take the PROGRAF later on. But they are delighted about his condition now. He is only taking steroids as immunosuppression and this is truly amazing! Since March, his blood count and liver functions are stable. His growth has been steadily advancing. His weight and height are catching up fast. He is learning new words everyday. One time over dinner he exclaimed, “Daddy, mang-ow pleeease....pleeease. Ow-kay?” And asks, “Mummee, ask, woh-ter, woh-ter (water), pleeease!” He can now say some of the food he eats like banana, hotcake, apple, bread, milk, etc...(and sometimes with a Singaporean accent) ☺. Greetings from Indonesia! Praise the Lord! He is an awesome God! I got your website from a friend of mine, Elisa. Her daughter, Aurelia (who just turned 1 year old) had Biliary Atresia. She is in critical condition now. We are collecting money for her now. We hope that God still give them a chance to do the liver transplantation. They are going to Singapore this Thursday to check which donor is good for Aurelia. Your blog is a great motivation for them. They are truly believe that God has greater plan for them. Please keep updating how Ethan is doing.